The 2011 Holiday Season is upon us and it is time to start thinking about what desserts we are going to be serving at our feasts, buffets and cookie exchanges, and to give as gifts. That is why I love these cookies, because they can be make 3 days ahead and kept at room temperature. They don’t need to be taking up precious space in your fridge. 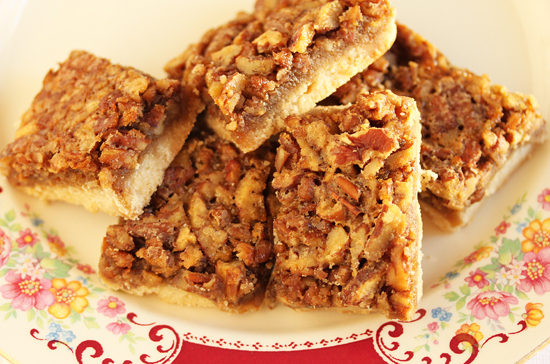 Another reason I adore Maple Pecan Pie Bars is you can cut them into small squares to serve. So instead of having to eat a big piece of really sweet Pecan Pie loaded with corn syrup, your guests can get the same great pecan flavor in a one-inch square sweetened with maple syrup. These are perfect for a buffet or brunch table. Or for taking as a hostess gift. And at home, you can cut the pieces as big as you want for yourself, of course. Who will know? 1. Preheat the oven to 350 degrees F. Butter a 13×9-inch glass Pyrex baking pan. 2. In a large bowl, mix together the flour, sugar and salt. Add the butter slices and cut into the flour with a pastry cutter until no butter is visible and it can be pinched into a clump. You can also use two knives or a fork to cut the butter into the flour, or your food processor. 3. With a sandwich zip bag over your hand, press the dough into the bottom of the baking pan. Poke all over with a fork and bake for about 25 minutes, until lightly browned. Remove from oven and set aside. 5. Sprinkle the chopped pecans over the baked crust and pour the filling evenly over all. 6. Bake about 25 minutes until the filling is set. Cool completely in the pan on a rack. 7. Cut into bars and serve. Cookies can be stored at room temperature for 3 days, then refrigerate. It is hard to believe that Thanksgiving will be right around the corner. These look so good! Thanks for making my morning a little bit sweeter I’m baking a batch of cookies and then heading to work. Sounds like a good start, huh? Much love and hugs from Austin! I make one very similar, but has corn syrup. How’s that for irony? You’ve just made me a convert to yours—without even tasting them! The holidays are not on my radar. My pop loves pecan pie and I’m sure he’d like these too. I’ve not been a fan because they are way too sweet. So how do these compare on the sweet spectrum? These are superb! The maple adds a nice complexity rather than just being overly sweet. I substituted 1/4 cup finely chopped pecans for 1/4 cup flour. 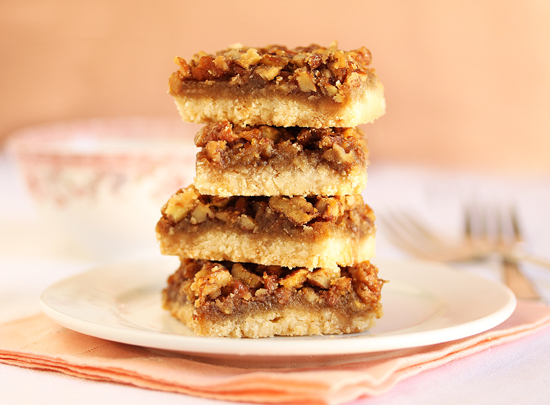 I wanted kind of a pecan sandie shortbread crust but even without that, they are really delicious. I don’t think I’ll ever make a regular pecan pie again.